For many, one burger may be just enough, but at BurgerIM, they encourage customers to eat two or three. BurgerIM is pronounced in Hebrew as “Burger-eem,” meaning “many burgers.” It is a restaurant from Israel that wants its customers to enjoy at least two burgers at once with endless possibilities to customize them. At BurgerIM, burgers can be ordered as follows: a single burger costs $6.99, a duo of burgers costs $6.99 and a trio of burgers costs $9.99. Customers can order as many as 16 burgers at the same time, which costs $44.99. As its name suggests, BurgerIm is all about options. There are 11 different types of 3-ounce patties offered, including Waygu beef, 28-day dry-aged beef, Spanish beef, breaded chicken, lamb, turkey, meat-free options, fish and falafel. The burgers can be served on white or wheat buns or be lettuce-wrapped. BurgerIM offers burgers such as the classic burger with ingredients including American cheese and a house sauce, a California-style burger with Swiss cheese and chipotle mayo, a Cowboy-style burger with an onion ring and barbecue sauce, and the Caliente burger with pepper jack cheese and habanero mayo. BurgerIM is also dedicated to variety with its sides, including fries in three different options- – signature round-cut fries, sweet potato and regular fries, onion rings and the option to have half-and-half of any of the choices of sides. To top the sides, customers can order Cajun Seasoning, Jalapeno & Cheese, Garlic Aioli and Bacon & Cheese. 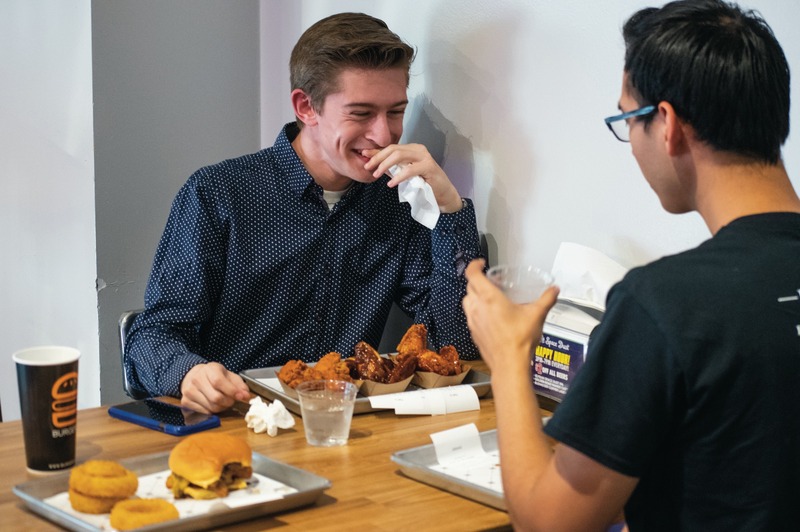 Pablo Leiva, freshman architecture major at California Baptist University, was nearly unable to decide what to eat because the restaurant has so many options. Aside from the burgers and fries, BurgerIM also sells bone-in and boneless chicken wings with sauces, such as barbeque, buffalo and sweet crunchy chili garlic. Kelvin Flores, owner of BurgerIM’s Magnolia location in Riverside, said he recommends ordering his favorite burger, the dry-aged beef Cowboy style. “It’s like the Western Bacon Cheeseburger, but with ours, we put a lot of premium flavor into it. Everything is cooked to order so when you get it, you can gather a lot of flavors because it’s all fresh,” Flores said. Nicole Flojo, Riverside resident, said she thought the ingredients made a difference. “It’s a little on the pricey side considering the portion size, but the quality shows. I enjoyed it and would eat there again,” Flojo said. Flores also said that unlike other locations, his location offers gluten-free buns instead of lettuce wraps and will be hosting “Wing Wednesday,” a day in which the wings will be offered at lower prices, which have yet to be determined. BurgerIM is located on the corner of Magnolia Street and University Avenue and is open 11 a.m. to 9 p.m., Monday through Friday.